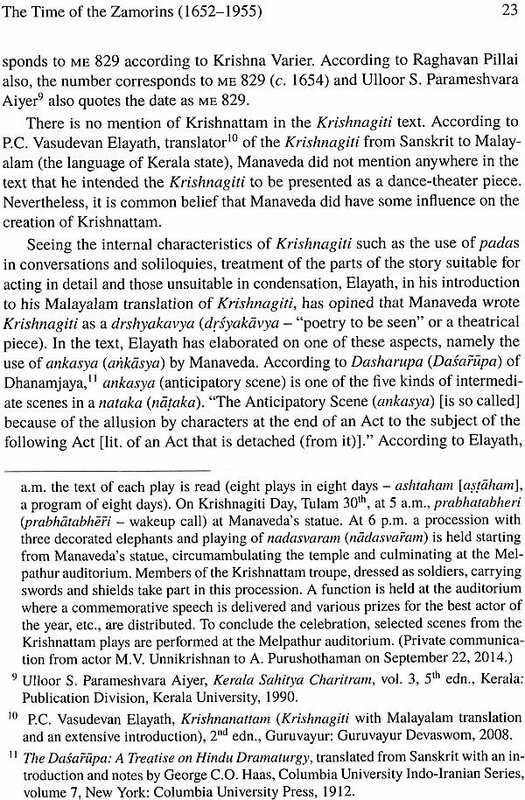 Krishnattam, a unique Sanskrit ritualistic dance-theater of Kerala, is one among India’s treasure trove of rare living artistic masterpieces. 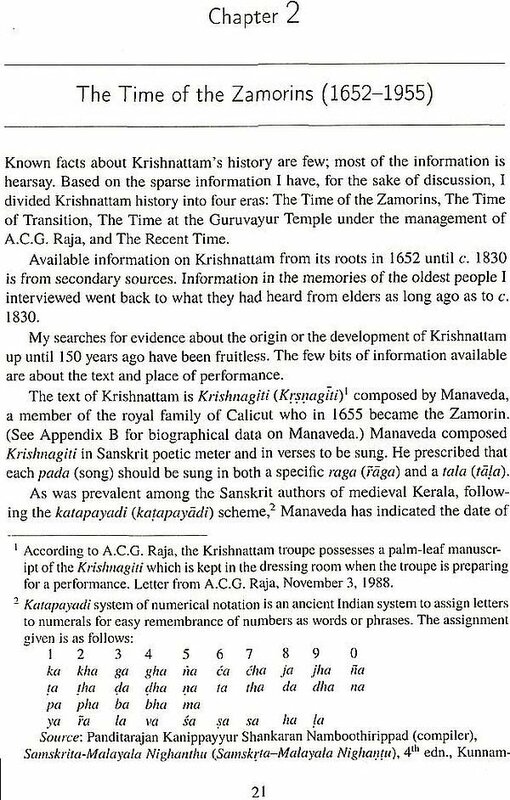 In time past, Krishnattam, based on the Sanskrit poem Krishnagiti by the Zamorin King Manaveda, thrived in the royal environment of the Kingdom of Calicut, receiving the adoration of small devoted audiences. But with India’s independence, the Zamorin lost his kingdom, and as his wealth dissipated, Krishnattam teetered on the edge of extinction. It was the Krishna-Vishnu Temple at Guruvayur that came to Krishattam’s rescue and has become an integral part of the history of Krishnattam. Here, again, Krishnattam remained in seclusion until 1961, when the troupe performed in Bombay, exposing it to a larger Indian audience and foreign interest. 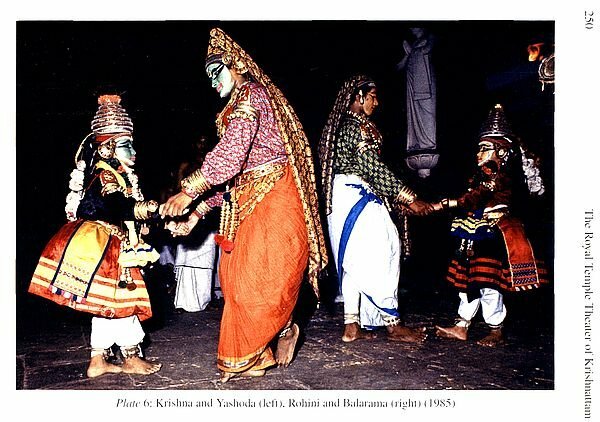 This history-travelogue takes one along in the dark of night to experience the Krishnattam plays, with their rituals and preparations, as the performers in fantastic, colourful costumes, dance, and mime the story of Lord Krishna’s life to the accompaniment of vocal and instrumental music. 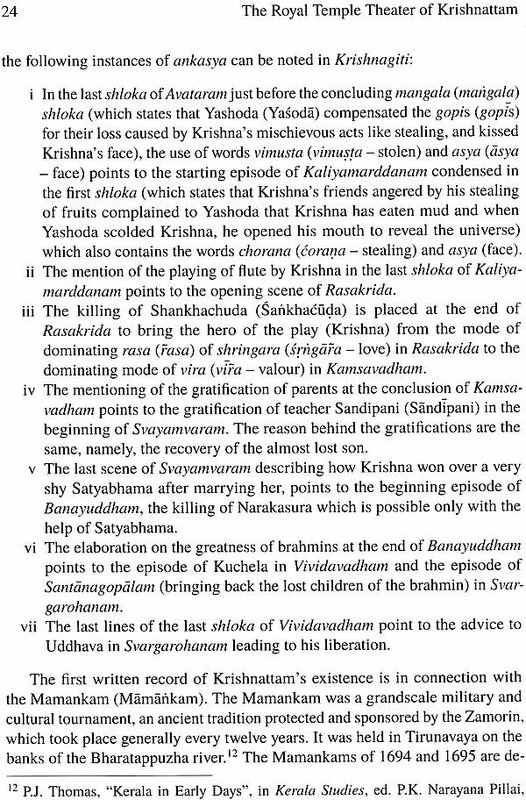 This volume, richly illustrated, makes one meet some people, who have been the soul of Krishnattam. The actor-dancers share the quirks of fate, the severity of training schedule, and the rigor of exercises that transformed them village children into performers. Currently, Krishanttam thrives at Guruvayur Temple, together with ample outside performances, as a devotional votive offering. The first author takes one along on her twenty-year journey to discover the history and attractions of this art so rarely performed outside its locale in south India. Co-authors, Robert Sikora, A. Purushothaman and A. Harindranath greatly enhance this edition with their new researches, translations, translations, and photographs. 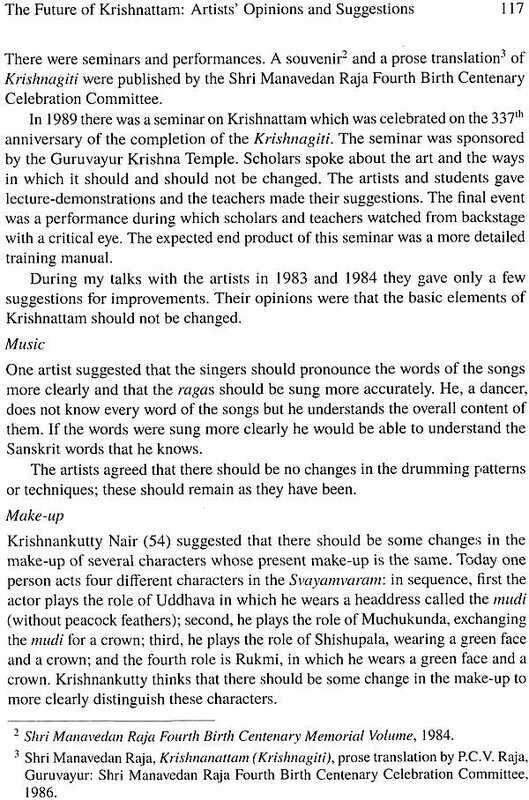 Martha Bush Ashton-Sikora did her PhD from the Department of Drama and Theater, Michigan State University with a dissertation on Yakshagana, a theatre of coastal Karnataka. As part of the Festival of India USA 1985-1986, she toured and lectured with the Krishnattam troupe during its USA appearances. She taught at the University of California, Berkeley, researched, and wrote about the theatre and theatrical aspects of the south-western coast of India, and contributed to South Asian Folklore: An Encyclopedia and Asian Theater Encylopedia. Robert Peter Sikora is MA in marine biology from the University of California, Berkeley. He has visited India several times sharing, photographing, and videographing the senior author’s interests in the performing arts as well as pursuing his own interests in wildlife photography. A. Purushothaman, a chemical engineer, currently working in Mumbai, and A. Harindranath, a professor of physics at Kolkata, grew up in the temple town of Guruvayur, watching Krishnattam plays and generally imbibing the culture of the land. They have written on the traditional arts of Kerala, translated writings from Malayalam sources, photographed performances and propagated them through print and audiovisual media. 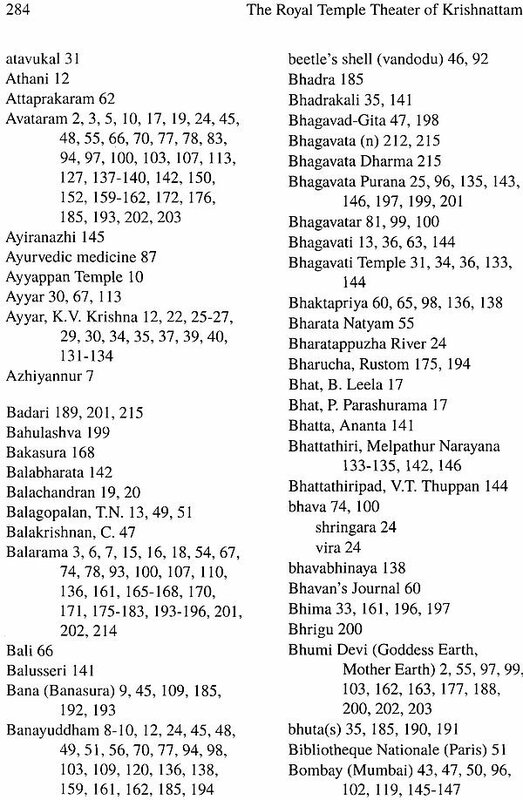 They have edited the book Temple Musical Instruments of Kerala written by L.S. Rajagopalan. Krishnattam, a sacred dance-theater form of Kerala, India, presents the life of the Hindu god Krishna in eight separate serial plays. The production of each play takes about four hours and includes music-vocal and percussion, dance, mime, and hand gestures, enhanced by elaborate and colourful costumes and make-up. Performance most often takes place within the Krishna Temple compound in the town of Guruvayur. Generally only Hindus are allowed inside. There are some performances of Krishnattam outside the temple. Interested persons can contact the Superintendent, Kshetra Kalanilayam, Guruvayur Devaswom, Guruvayur-680101, Trichur district, Kerala State, India for locations where non-Hindus are welcome. 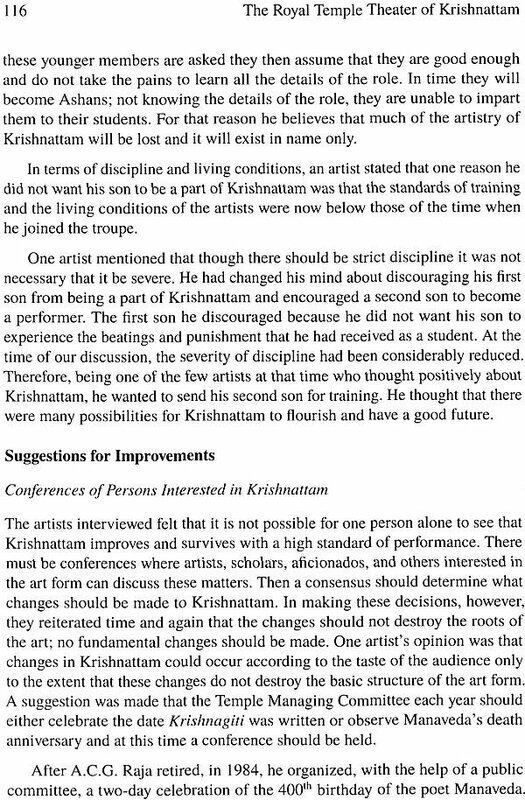 I first saw Krishnattam in 1970 at a small village temple festival and since that time have been collecting data through both fieldwork and correspondence.During this time I was granted permission to enter the temple compound and have witnessed a total of twenty-four plays there and at other festivals and special occasions. 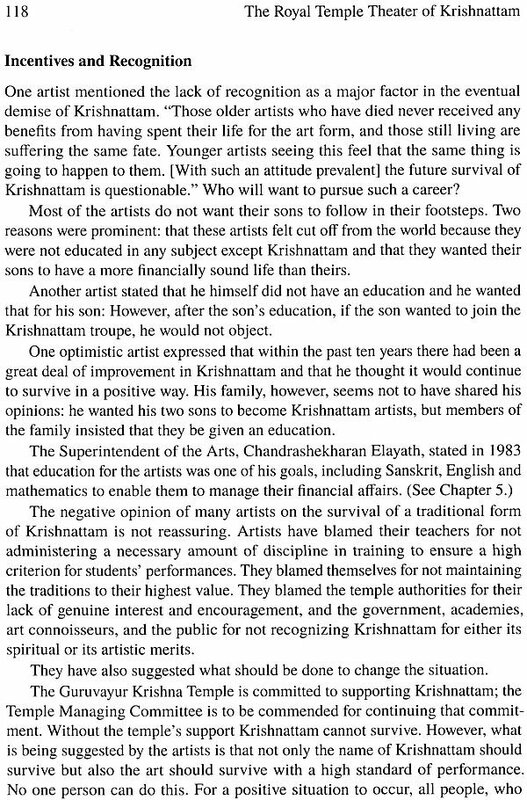 The general seclusion of the art is a major factor in the way of Krishnattam being more widely known. 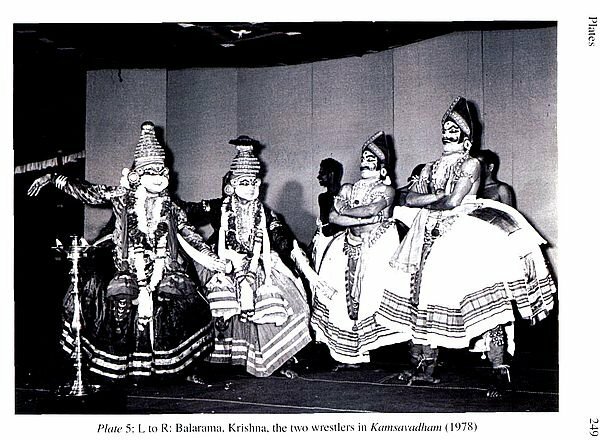 Were it more accessible, Krishnattam would undoubtedly find much favour among world theatre-goers and connoisseurs alike, as it displays some exquisite masks used only in Krishnattam, some very fine dance steps, and unique choreography and staging techniques. It is my hope that the present work will result in this exquisite art being known to a wider audience. 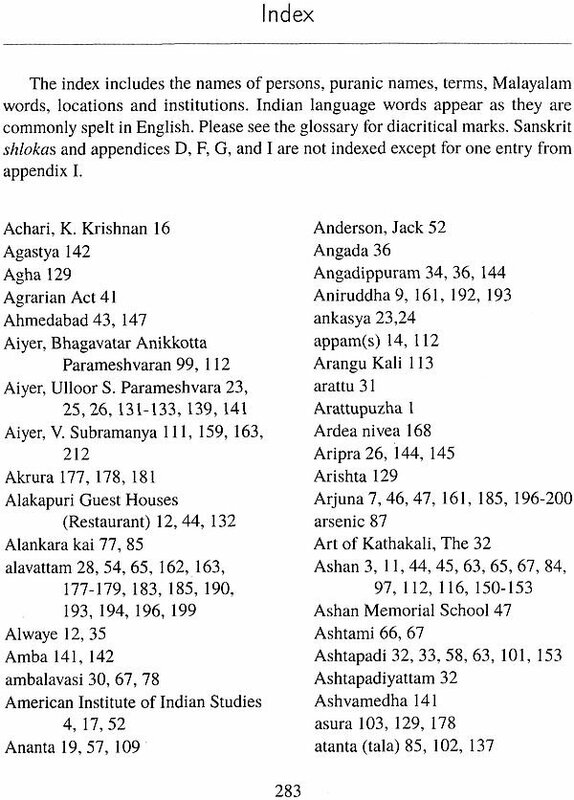 Malayalam words used in the text appear as they are most often spelled in English. The first time each world appears it is followed with diacritical marks in parentheses. If there is no change in the spelling and diacritical marks are not required, the world is not repeated. These world appear in the glossary according to their popular spelling and with diacritical marks. Late in the afternoon on May 6, 1970, in a cloud of dust, we sped along the dirt roads that passed through fertile rice fields. I was going with my friend M. Lakshmy Kutty and my teacher, Hiriadka Gopala Rao, to a temple in the Kerala village of Arattupuzha, near Trichur, to attend the Puram Festival. 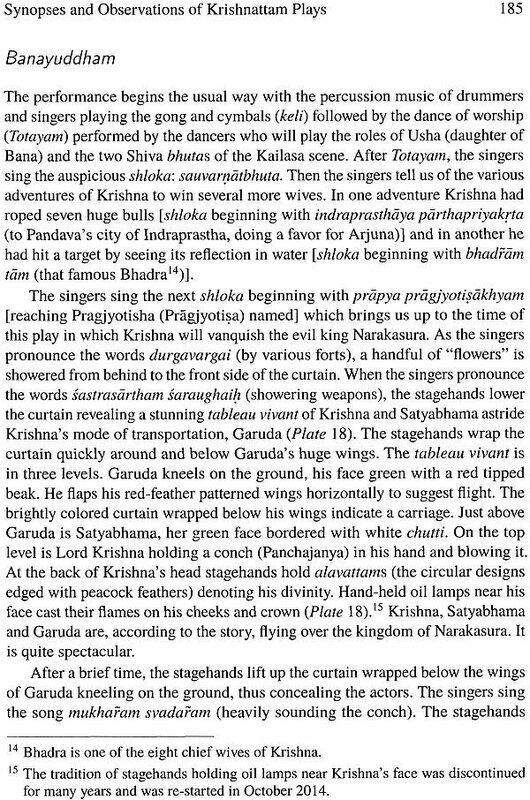 Gopala was teaching me the dance of Yakshagana (Yaksagana), a theater form of South Kanara district in Karnataka. 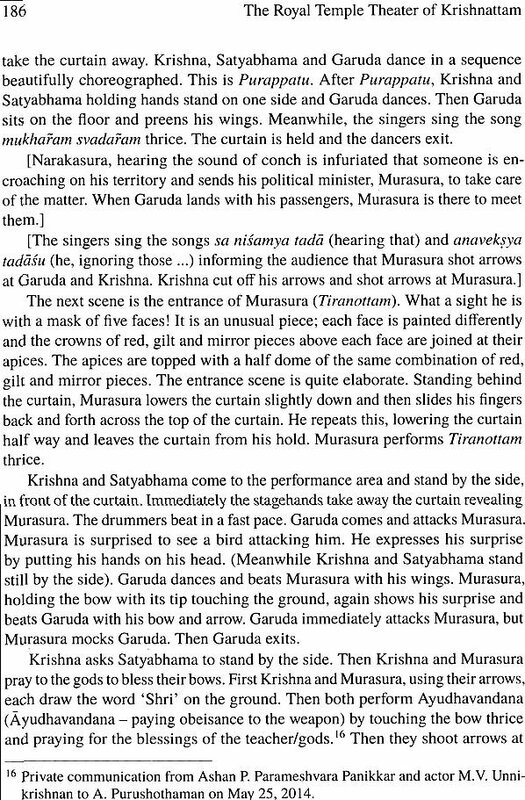 We were on a trip to search for similarities between Yakshagana and other south Indian dance and theater forms. Lakshmy had invited us to begin our search in Kerala. 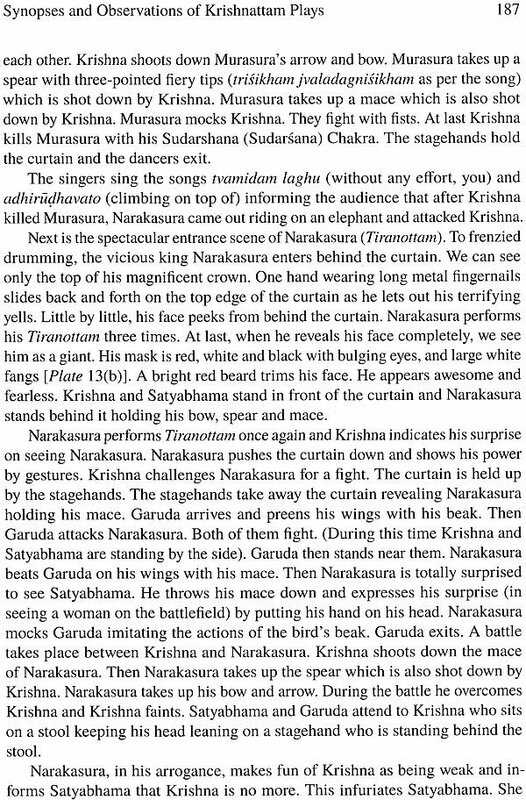 It was on this expedition that we first encountered the sacred dance, Krishnattam (Krsnattam). Brightly attired people walked in lines on top of the small embankments that separated one paddy field from another. They made a colorful crisscross among the otherwise green fields. Near the temple the fields had been harvested. Dry tufts of paddy stems held firmly to the soil. All around us at the horizon were coconut palms. We scurried to join the gathering throng, not wanting to miss anything. For Lakshmy, who brought us, this festival was a common occurrence; born and raiged in Kerala, she had attended this type of celebration many times. For Gopala and me something unusual was about to happen. Way above the heads of the crowd, we could see huge red and white umbrellas and some shapes that appeared to be brass and bronze reflecting the sun. Something dark was moving under them. Moving a little closer, the dark shapes became elephants with triangular gold ornaments hanging from their foreheads down their trunks. In all their finery they appeared quite regal. One carried the image of the deity, laden with garlands of fresh flowers. Several other elephants followed it, stopping and starting at the command of their mahouts. Sounds of conch, horn and double-reed instruments filled the air, punctuated by the clash of cymbals. The scene was mesmerizing. The procession stopped and started as it made its rounds to the different sacred areas near the temple, repeating again and again the waving of incense! and burning oil lamps. Late afternoon blended into early evening. Devotees rang the temple bells and people lit small oil lamps that lined the exterior walls of the temple. In the field near the entrance to the temple compound was a small temporary stage open on all sides and roofed with palm-frond mats. Near center stage front stood a bronze oil lamp several feet tall. Folding chairs were on three sides. A Krishnattam performance was to take place soon. 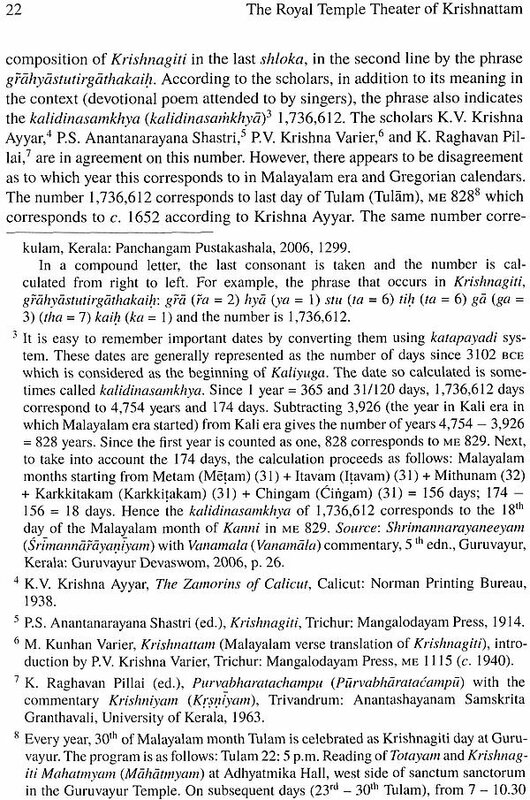 Several years before, I had read about Krishnattam. I knew that it took place within the compound of a temple in Guruvayur and that only Hindus were allowed inside, so I had put out of my mind the idea of ever seeing it. On this rare occasion it would be performed outside of its homebase. We had come upon it by chance. We sat in the front row and by another chance we sat by the troupe's manager, A.C.G. Raja, who chatted with us about Krishnattam in general and told us the synopsis of that night's play. 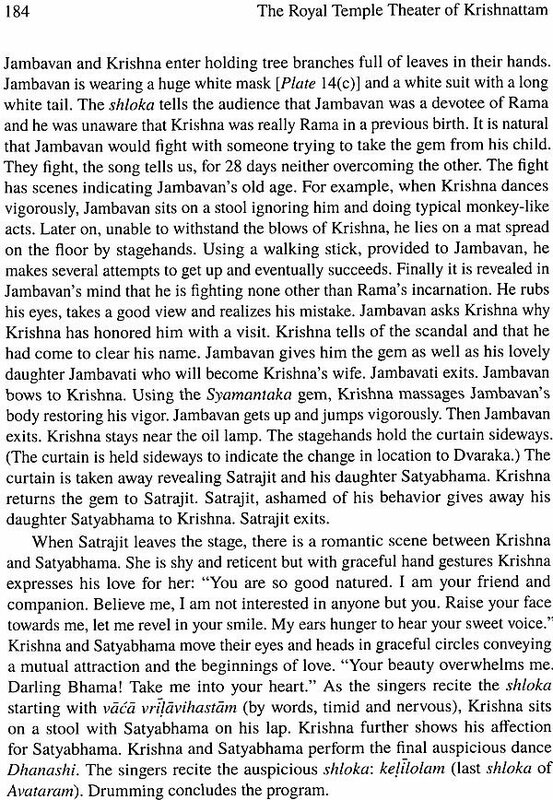 Avataram (Avataram) is the first play in a series of eight that dramatizes the life of the Hindu god Krishna (Krsna); this play, Raja told us, would be about the birth and early childhood of the god. The oil lamp on the stage was lit and the musicians mounted the stage with drums and cymbals and began the various rhythmic beats for attracting an audience. Two people came with a colorful curtain of red, green, golden yellow and black. Pinned to its center, a metal relief image of the Lord of Guruvayur (Plate shimmered from the light of the oil lamp's flame. Behind the hand-held curtain, dancers began performing. We could see only feet and tops of heads. The dance was in honor and praise of the gods. As the curtain was gradually lowered we saw more of the dance and listened to the bells on the dancers' legs jingling to the rhythm of the drums. In time the curtain was removed and the performers danced in line with knees bent outward in the plane of the shoulders. They gracefully moved their torsos in vertical circles, in semicircles, and from side to side. Eye and facial movements were also a prominent feature of the dance. This first play in the series, Avataram, was most often sponsored by those devotees whose prayers to have a child had been answered by the Lord Guruvayu- rappan (Guruvayurappan), chief deity of the Guruvayur Temple. (The image in the Guruvayur Temple is of Vishnu but it is often decorated as Vishnu's human incarnation, Krishna. The devotees, therefore, literally refer to the temple as the Guruvayur Krishna Temple.) This play was one of the most often sponsored plays. This evening had brought an unexpected adventure. Before we departed, Raja invited all of us to visit Guruvayur. He mentioned that I could see the training though I would not be allowed into the temple to see a performance. Within the month we did visit Guruvayur. At that time there was a hotel with a balcony overlooking the temple compound. I saw Krishnattam from that vantage point, but from that distance the detail of decoration and movement was not clearly visible. During subsequent trips to India I often visited Mr. and Mrs. Raja and some-times visited the school. 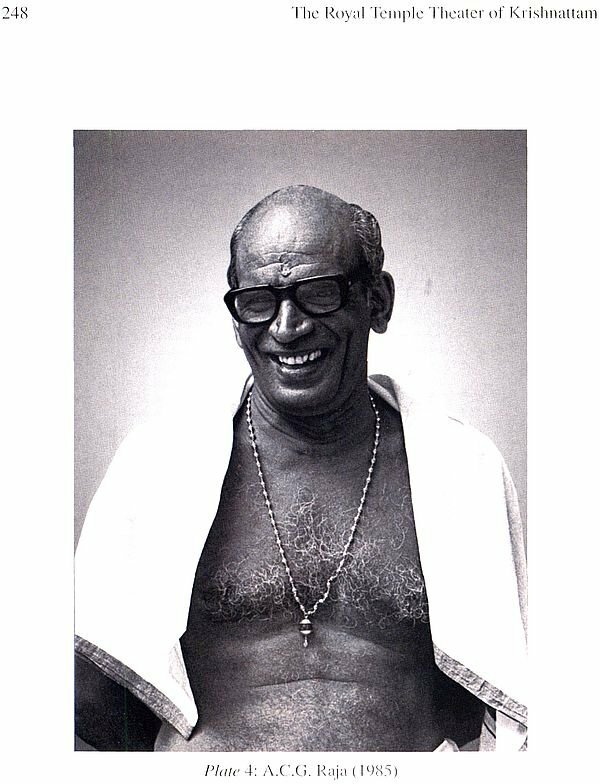 It was not until 1980 that I had the opportunity to see Krishnattam inside the temple and to begin research on the art form. In 1979 I met Sanjeev Prakash, a cinematographer, in New Delhi. He had seen the annual Sangeet Natak Akademi Award performances for 1977-78 which included that of Chingath Shankaran Nair in the role of a Krishnattam Krishna. The performance was a rare sight in New Delhi and Prakash was intrigued by the form; he wanted to make a documentary film and asked me to collaborate with him. We proposed an exploratory trip to Kerala in 1980 to discuss the matter with the temple authorities. This project was funded by the American Institute of Indian Studies. In January of 1980 we met with T.C. Balakrishnan Nair, Administrator of the Guruvayur Krishna Temple. 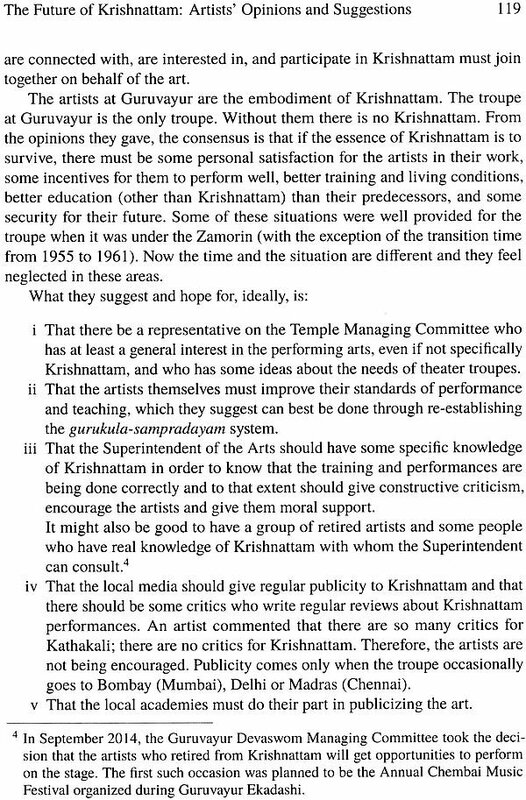 He seemed supportive of our ideas and agreed with us that the sacredness of Krishnattam could only be maintained if the film were made within the temple compound where its performance usually took place. It was agreed that I could enter the temple compound. I looked forward to that night's program, the first I was to see inside the temple. 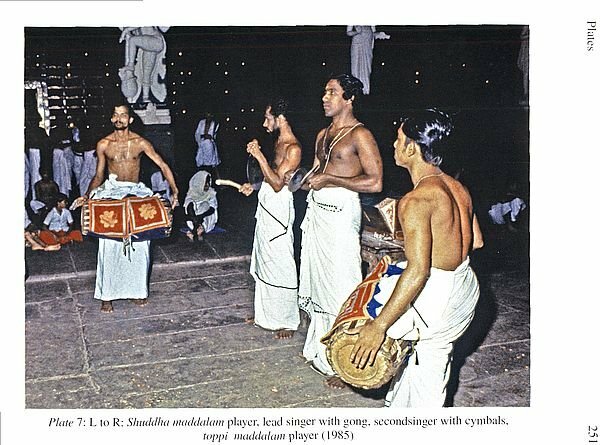 That day late in the afternoon, drummers and cymbal players stood near the entrance to the temple playing the keli (keli), a specific musical sequence announcing to all within hearing distance that Krishnattam would be performed at the temple that night. About eight o’ clock we went to the temple to see the God make his rounds. In the form of an image beautifully decorated with flowers the God Vishnu rode with human attendants atop a majestic elephant. The elephant's ornaments reflected the flames of hundreds of tiny oil lamps burning along shallow shelves on the temple's outside walls. Temple musicians playing drums and double-reed instruments led the elephant around the temple three times. The God, satisfied that all was well, then returned to the temple, and priests closed the doors of the sanctum sanctorum.